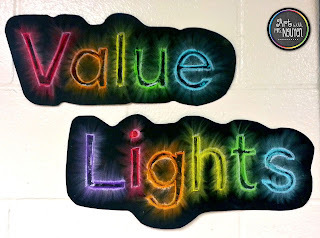 Fourth graders began by reviewing what they already knew about value (the element of art). Afterwards they began working on their art projects. To begin students glued down a piece of olive green yarn to a 12"x18" piece of black paper. The only stipulations I gave them was that it should start from the left end of the paper, reach all the way to the right end, and should make some sort of interesting line (so not just a straight one). Then we put those up in the drying rack. Next students took a light bulb tracer that I had created from a die-cut I had from last year and traced it onto a piece of 6"x18" black paper (most students traced between 4-6). 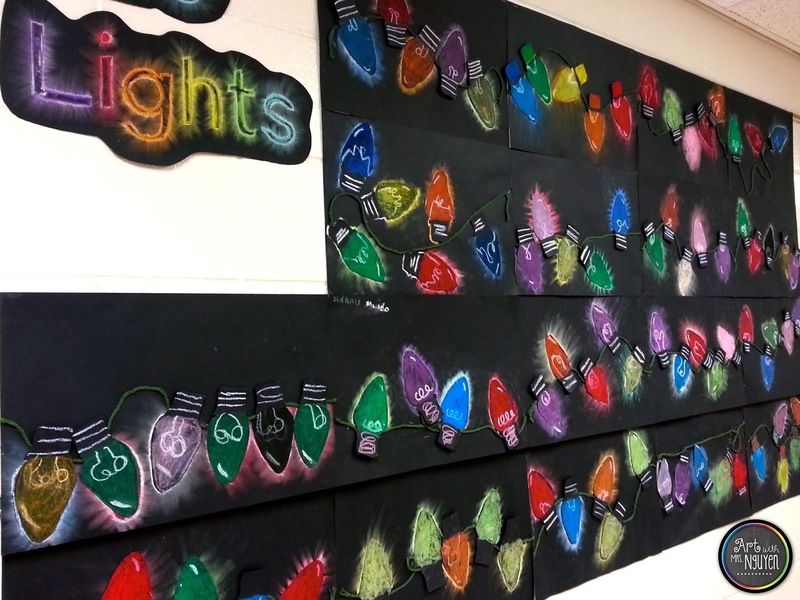 Once all their bulbs were traced in pencil, they used oil pastels to outline and then color them in. Once they colored them in, they used their fingers to smudge/rub in the oil pastel (this gives is a smoother, more glass-like implied texture). Then using a white oil pastel, they drew in the filament (again they could create any kind of curvy/wavy line they wanted). 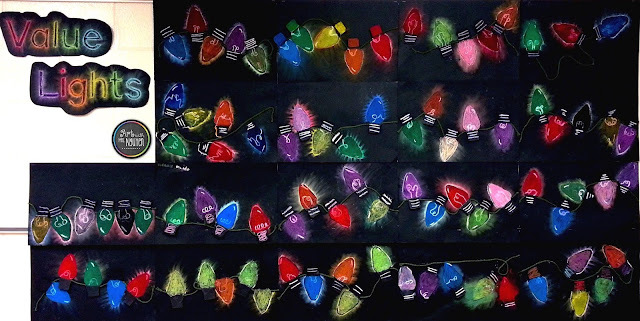 Once it was drawn in, they used their "tickle finger" to rub the white from their filament back-and-forth slightly into the color of the bulb (this creates a glowing effect). Then they re-outline their filaments with white again. Finally a highlight is added to the tip of their bulb with white oil pastel. The next step for students is to cut their light bulbs out and arrange them onto their larger black paper with the yarn on it. Once they are happy with the arrangement, they trace the outline of the bulb in pencil onto their black paper. To create a glowing effect on the paper, we used chalk pastel to create an outline (slightly inside the pencil line) with white and then with the color used for the bulb, and then made quick finger-strokes to spread the chalk pastel outwards. 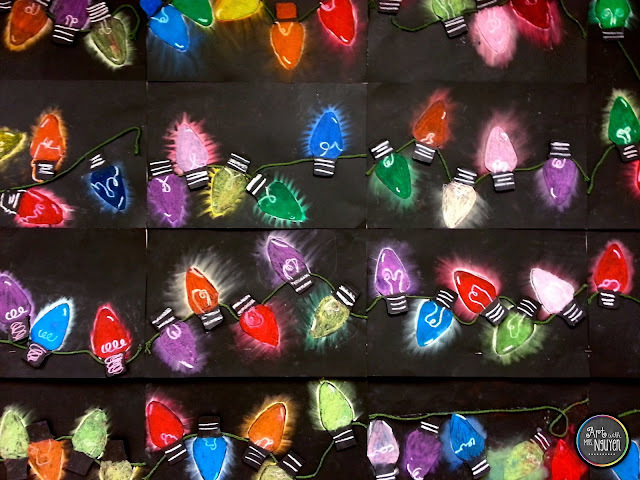 Once they are done creating the glow effect, students use a glue stick to apply glue to the back of their light bulb, and then position it on top of the chalk pastel glow. These are so much fun and SO festive. Thanks for all the detailed instructions! There are a lot of classroom teachers at my schools that are doing this lesson with their students. It's fun to see! This is really great, and I can't wait to try it, but shouldn't they be called "Hue Lights" instead? 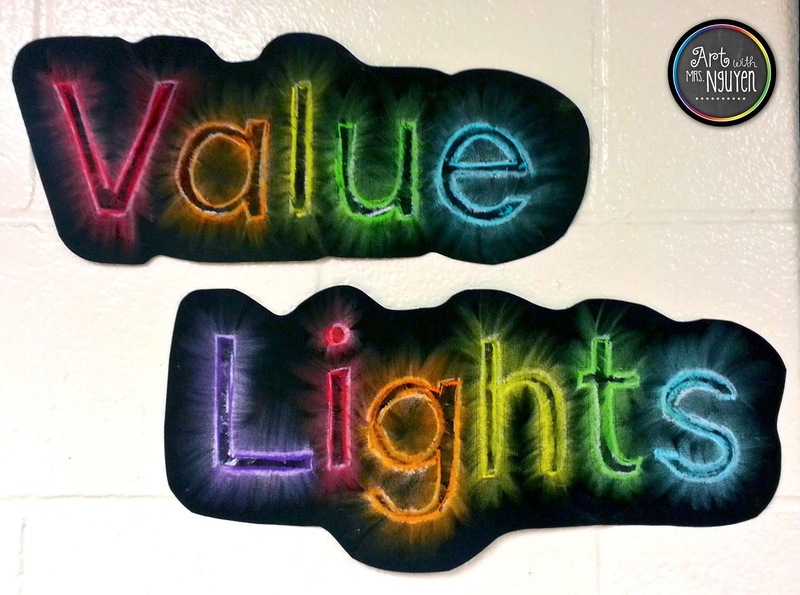 I thought value was about how light or dark a color is.... Thanks so much for posting the project and directions! 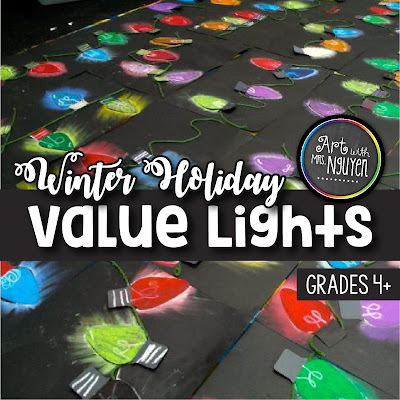 I use this project as an extension lesson to teach value. 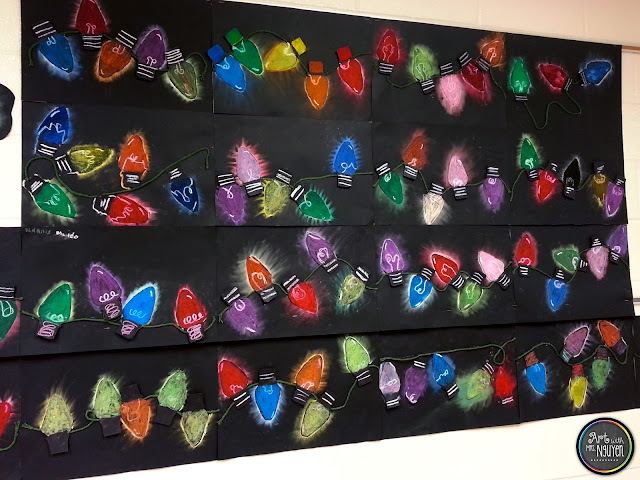 While we're doing this lesson I talk with my students about adding highlights (which create tints when blended with the colored oil pastel) and how a range of shades are created when the chalk pastel is blended into the black paper.